On Monday martial law was declared in ten Ukrainian regions after Russian forces impounded three Ukrainian naval vessels near the Kerch Strait, an important shared waterway, on Sunday ramming one and detaining 24 sailors, including three wounded in shooting by the Russian side. Since then both Moscow and Kyiv accused the other of flouting the rules of passage through the strait. Martial law affects the following ten provinces: Vinnitsa, Luhansk, Nikolayev, Odessa, Sumy, Kharkiv, Chernihiv, Kherson, Donetsk, Zaporozhye and inland waters of the sea of Azov. Ukrainian President Petro Poroshenko has been accused to use the crisis in the Kerch Strait to improve his own political fortunes. Deeply unpopular in Ukraine Poroshenko faces an election next year, and some critics question whether he is trying to use the standoff as a way to boost his standing both at home and abroad. 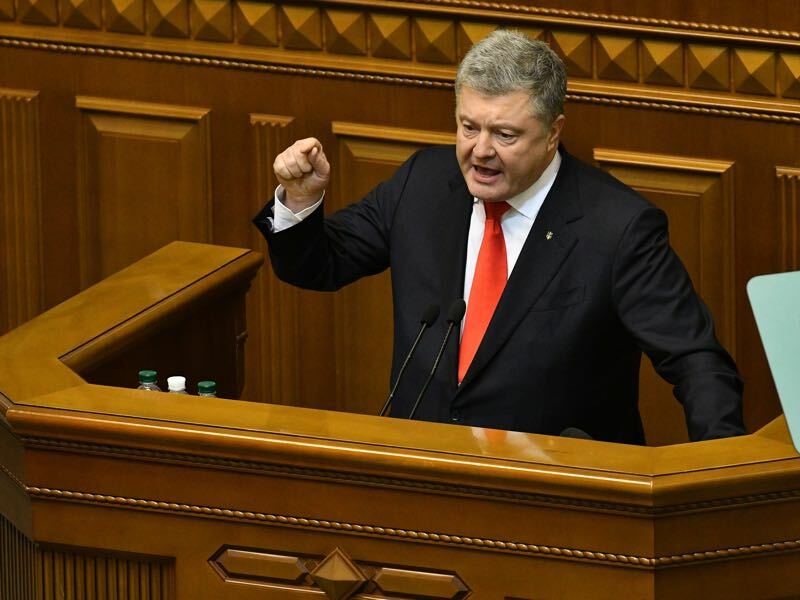 Poroshenko’s unpopularity within the government, in fact, was shown by the way the original martial law bill was handled in the Ukrainian Rada (parliament). His original proposal was cut down from 60 days to 30 days of martial law. It has been somewhat unclear whether martial law will only be imposed on the ten land regions bordering Russian land territories or also include regions with a Russian sea border, which would bring the number of regions up to 27. Furthermore, it has been somewhat unclear what the impact martial law would have on the regions bordering Russian territories. According to The Independent, the presidential amendments introduce few restrictions on the overarching 2015 legislation covering martial law. It allows for extrajudicial searches of property, travel bans, closing media deemed against national interests, bans on rallies and demonstrations, limitations on private correspondence and communications, and even introducing limitations on education, private and family life. The Independent, reported further that the new law offered no concrete examples of how the legislation would affect ordinary citizens. The measures were, she said, “a legal mechanism allowing Ukraine to react expediently … in the event of open aggression from Russia”. The lack of clarity in the wording of the law further fuels suspicions, both at home and abroad, that Poroshenko is simply interested in strengthening his grip on power. Poroshenko’s initial demands that martial law should be introduced for 60 days, in particular, point into that direction as it would have postponed the Presidential election in March. How will martial law impact football? While it remains unclear what impact martial law will have on Ukrainian domestic and international politics, it already had an impact on Ukrainian football. There is always a fine line between football and politics in Ukraine. In this instance, there is an immediate impact and a medium-term impact when it comes to how martial law will affect football in Ukraine. The first impact was already felt this week. On Thursday Vorskla Poltava were supposed to meet London based side Arsenal in what would have been the biggest match in the club’s history. Whether that decision, however, was ultimate was not even fully known on Wednesday night. Vorskla President Oleg Lisak told the media on Wednesday that there was no guarantee that the club would be playing. 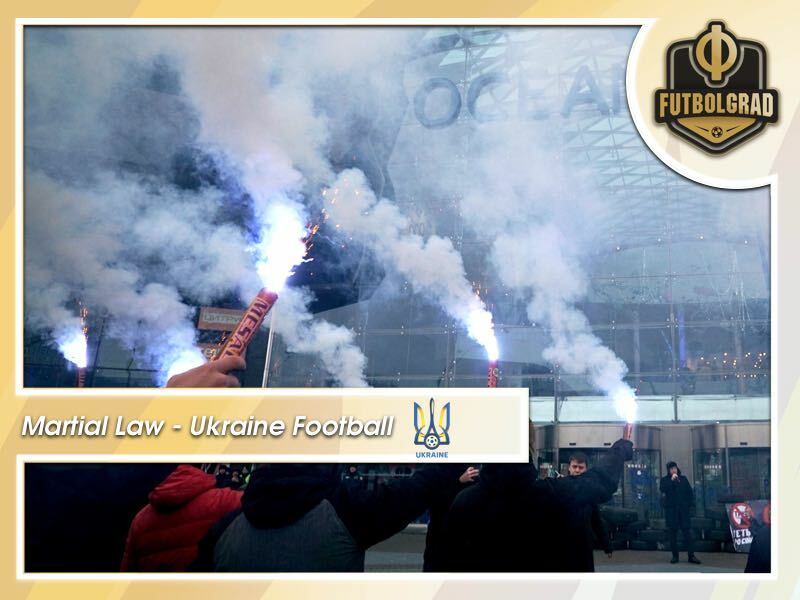 The Ukrainians felt aggrieved by UEFA’s decision to move the game despite the fact that the Poltava region, of which the city of Poltava is the capital, was not among the ten regions that will be affected by martial law. Located 340 kilometres east of Kyiv the relocation of the match makes it impossible for most Poltava fans to support their club live in the stadium. Furthermore, unlike clubs from Western Europe, smaller clubs in the post-Soviet space are dependent on the revenue earned from ticket sales against big clubs. Arsenal playing at Poltava’s Oleksiy Butovsky Vorskla Stadium would have been one of the biggest matches in the club’s history. Without a doubt, the 24,000 seat stadium would have been filled to the rafters. In Kyiv, however, ticket sales for the 70,050 seat Olimpiyskiy National Sports Complex have been slow and it is expected that only a few thousand fans will show up for the match. The English club, however, felt concerned about the team and their own fans and having to travel per bus from Kharkiv, which would be in one of the areas affected by martial law once it is officially signed off. “It doesn’t change a lot to play here. In 90 minutes it is not a very big change. It is clear they are playing in Ukraine, not in their town, but they can also move their supporters to Kyiv,” Arsenal manager Unai Emery explained to the BBC. “The urgent decision of Uefa to relocate the match to Kyiv was based on the sudden introduction of martial law and the uncertainty of the security situation in some parts of Ukraine and particularly given the extremely short timescale available to evaluate all existing risks,” read a statement. “Uefa regrets the inconvenience the relocation of this match has caused to supporters and FC Vorskla,” the football governing body added. For Vorskla, and the fans that care about the club, UEFA’s consideration seems final. On Wednesday the club tweeted a picture of the team leaving by bus to Kyiv – showing that club officials had very little hope of overturning UEFA’s decision. Meanwhile, Ukrainian outlet tribuna.com has been somewhat critical of the decision made by UEFA. Using an image showing an #EqualGame UEFA Respect sign inside the Vorskla Stadium the article in Tribuna criticised UEFA’s lack of consideration towards the club’s fans. The article also asked what the decision by UEFA will mean for future games in the country. Dynamo Kyiv and Shakhtar still have outstanding matches in UEFA competitions this season. Given that UEFA was willing to move Vorskla’s fixture to Kyiv Dynamo’s game against Jablonec seems to be safe – especially as the Czechs will be unlikely to have the sort of lobby to move a match to a different location. Shakhtar’s game against Olympique Lyon is a different matter, however. With a victory against OL, the Ukrainian champions would advance to the round of 16 of the Champions League for the second season in a row. Exiled from their home in the Donbass due to Ukraine’s war with Russian financed rebels Shakhtar have now found a permanent home in Kharkiv. The Kharkiv region, however, is one of the areas affected by martial law. “They have suffered and continue to suffer. UEFA has taken the decision to relocate the match that Arsenal must play against Vorskla in Kyiv. So there will probably be decisions about us,” Olympique Lyon President Jean-Michel Aulas told the press. “In any case, we have not too much desire to go to Kharkiv. There is a lot of insecurity at this time. We hardly find a plane to go there because the French aircraft are not insured. Surely there will be discussions in the coming days with UEFA to make everyone safe and do a very good game against Donetsk. Where we were playing, we go to win”, Aulas concluded. Shakhtar’s alternative venue is the Arena Lviv in the west of the country. The club originally moved their following their forced exile in the spring of 2014. But due to the lack of fan support in Lviv eventually moved the club east to Kharkiv. Finally, there is the issue of domestic games. Last season Dynamo Kyiv stated security concerns ahead of their match against Mariupol. Ultimately, Kyiv refused to travel to the city and ultimately the case was handled by the Court of Arbitration for Sport (CAS), which handed Mariupol the three points. Those three points ultimately cost Dynamo the championship last season. According to the Ukrainian sports portal, Tribuna martial law will not directly impact domestic competitions for now. “Restrictions on carrying out mass sports activities can only be applied in case of availability of information on serious risks to citizens received from SBU and law enforcement,” Sports Minister Ihor Zhdanov explained. “The Ministry of Youth and Sports, relevant national federation for sports and competition organizers will separately inform the society about each case. At the same time any sports event in one of the affected areas would come with enhanced security measures,” the page added. While in general domestic competitions should go ahead as planned martial law means that the Ministry of Youth and Sports and individual federations, as well as the security apparatus, could shut down games should they impose a security risk. Desna, for example, have already moved their game against Zorya from Chernigov to Kyiv due to the recommendation of local security advisors. The declaration of martial law and the impact it had on Vorskla’s home game against Arsenal has returned the conflict between Ukraine and Russia back to the world’s centre stage. Whether it will stay there for long remains to be seen but the impact of the decision is likely to be felt among Ukrainian clubs for some time.